Your children are school-aged now, your life is busy, and you find your mind frequently wandering off to a quiet place, perhaps surrounded by mountains, with a calm, clear lake in the distance and a gurgling creek outside your rustic chalet. You don’t hear the sound of traffic, or electric leaf-blowers, or the evening news. You smell fresh rain and warm apple strudel as you get cozy on the couch under the fluffy down-filled comforter you pulled off the bed. But then, your family get-away to the Austrian Alps is ruined because . . . the kids are bored!! This won’t happen if you take them to one of the most charming villages in the Alps, Hallstatt, in the upper Austrian region of Salzkammergut. Just getting there is fun: it is only accessible by ferry unless you have a car (which isn’t optimal because car parking in town is verboten.) The kids will love the ferry ride, and mom and dad, well, their jaws will drop at the beauty of the approaching landscape and enchantment of this secluded, fairy-tale village. Hallstatt is etched into a mountainside, sits precariously on the edge of stunning Lake Hallstätter, and is a World Heritage Site for Cultural Heritage for its many major Celtic archaeological findings (i.e. it’s very, very old). The lake has a beautifully designed children’s playground and swimming area with a diving platform, a slide into the water, and a two footbridges over to a little man-made island. Of course the water’s cold (it’s melted glacier) but my kids didn’t have a problem going in! The little island you see is part of the children's play area. In addition to the lake, there are two other fantastic activities for families in Hallstatt that will defeat any child’s boredom or rainy day blues. The first is a tour of the world’s very first known salt mine, and the second is a trip to the Dachstein Ice Caves. It’s an easy hike along the hillside, with sensational views, from the town center to the Salzwelten Hallstatt salt mine. (There’s a two-way funicular available to ride too, if you’d rather.) At the start of the tour, each guest dresses into a colorful cover-all with a padded leather fanny. This padding is essential, for guests enter the mine the same way the miners do: straddling a 209 ft. long thrilling, wooden slide. 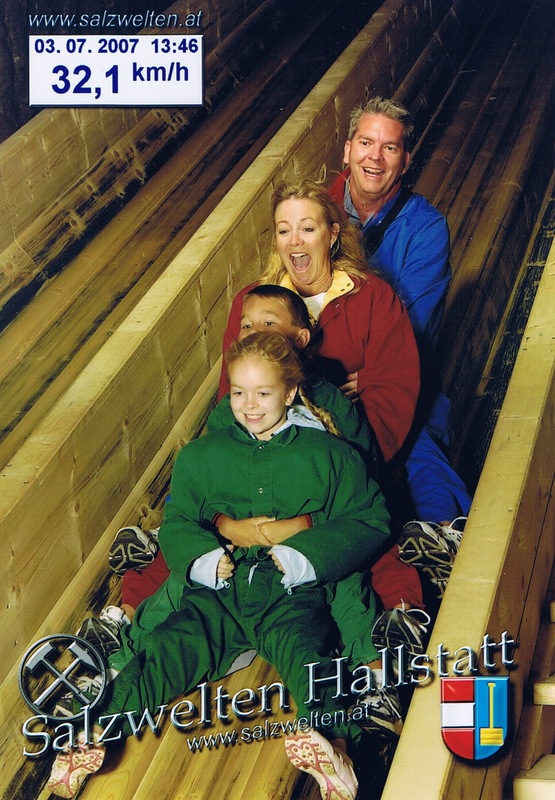 They take your family picture racing down the slide together and measure your speed with radar, too. The subsequent tour of the underground salt lakes and crystal chambers is fascinating for children and adults, and to exit the mine you ride out aboard a tiny train. Talk about fun for kids of all ages! The train that takes you out of the salt mine. The Dachstein Ice Caves are not directly in Hallstatt, but only a short bus ride to the other side of the lake above the town of Obertraun. Once there, follow the signs to the Dachsteineishöhle (Dachstein ice hole) and you will find the ticket office for the gondola which takes you up to the caves. After you reach the top by gondola, you will then walk about 15 minutes up a trail with incredible views of Lake Hallstätter. Soon you will see the cave entrance. Pull on a sweater and enter stunning caverns of ice stalactites and stalagmites, illuminated natural ice sculptures, and narrow passageways with your very informative guide. Your family will gasp at this mysterious natural wonder. We have very fond memories of our stay in breathtaking, panoramic Hallstatt and recommend it to anyone, not just families. Even the hotel we stayed at in Halstatt was picture perfect, and probably one of my favorite inns ever. It will take another post just to describe, so stay tuned! Following back from Adventures of a Thrifty Mommy! Oh My Gosh! I am so saving this idea for when we finally reach school age! It sounds soooo fun and photos are gorgeous! Such a cute blog... and this looks SO much fun! Thanks for the follow. what a great blog! Thanks for coming over to our blog. Followed you back. Looking forward to seeing more. really fun blog! and GREAT tips on what to and not to do with young kids! thanks for posting. Wonder if you have tips on what to see with young kids around Lake Constance? There are some great bike trails around Lake Constance and you can rent bikes for the whole family! Lindau is a terrific medieval town - actually on an island in the lake - and you can take boat tours from there. From Lindau you can walk or bike to Bregenz, another great town, and if you're there in July or August and can get a babysitter, be sure to get tickets to the Bregenz Festival - it's a floating theater! Also checkout nearby St. Gallen in Switzerland - one of the most charming towns ever.